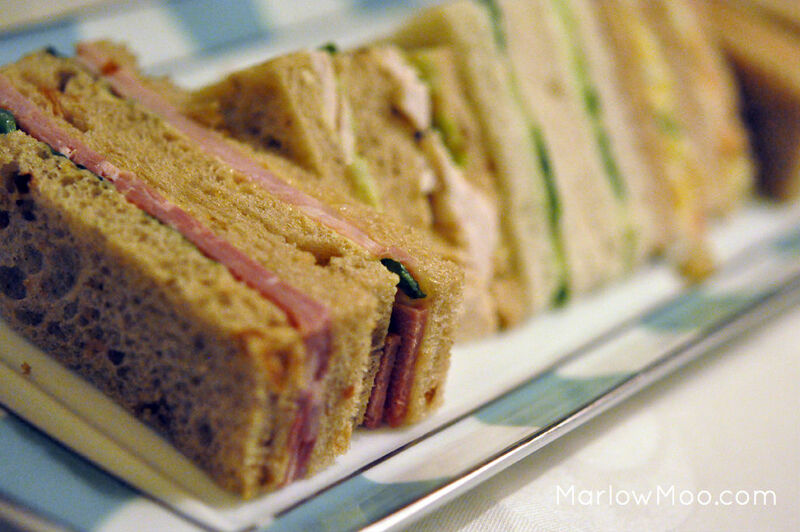 We began with a variety of finger sandwiches, including smoked salmon, chicken, egg salad, ham and cucumber. My favorites wound up being the ham as the mustard gave it a mild kick, and the smoked salmon dissolved in my mouth. 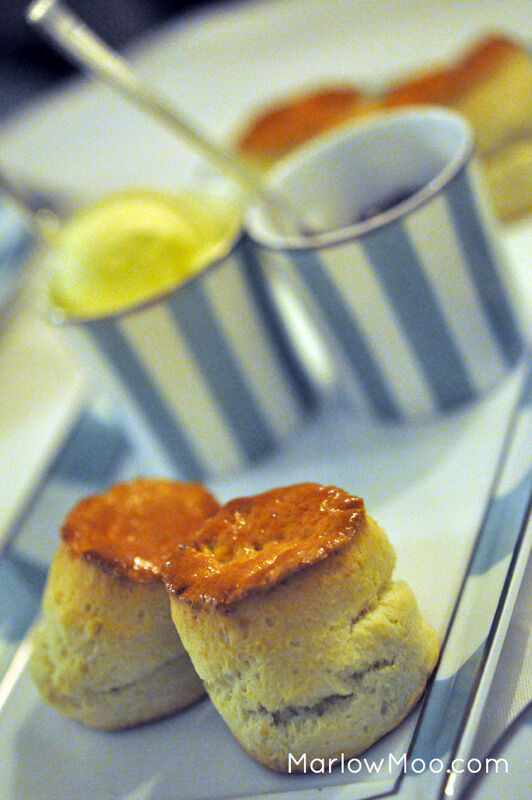 They then brought out two types of scones, apple and raisin, accompanied by clotted cream and Marco Polo jam. 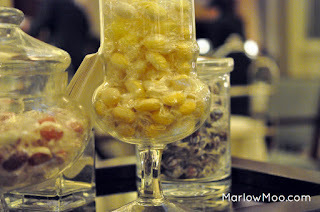 On our last visit the server told us the Marco Polo jam was made specifically for Claridges, however, we found out on this trip while we were in Paris that that wasn’t the case and was actually made by Mariage Freres, a teahouse that has been in Paris since 1854. In fact, we managed to buy a few jars of Marco Polo jam in Paris for significantly less than what they sell it for at Claridges. The scones were crispy on the outside, but were not as moist as I remembered them being inside. 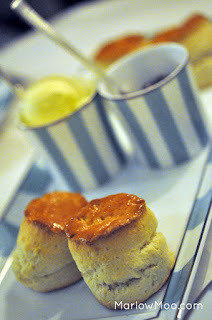 However the clotted cream was as thick and rich as I remembered and the sweet jam paired perfectly with the cream. High tea finished with a selection of pastries, including their “Ooh la la” cake, which was a chocolate, hazelnut, and caramel cake. The cake itself was incredibly soft and moist, and was practically just chocolate mousse that covered a sweet and creamy hazelnut and caramel mousse. The chocolate mousse was rich, topped with blackberries, apricots and passion fruit, the tartness of the fruit helped to balance out and cut the sweetness of the chocolate mousse. The vanilla cake had a nice crispy pastry and was filled with vanilla flavored cream. Finally, the fruit tart was a refreshing reprieve from the other pastries, filled with fresh and juicy fruit, while the tart shell was flaky and lined with rich cream. Before leaving, we were invited by the server to fill up paper bags of candy from a cart with a variety of different types of candy located at the door to the entrance. The service was disappointing and lackluster on this visit. Upon arriving and being seated, the hostess offered to take our coats, but before we could reply she disappeared suddenly and never returned. As well, we had to ask for our tea that had not arrived yet when they brought out the first course, which we didn’t have to do on our previous visit. Our server also did not check on us as often as our last visit, where we hardly ever had to refill our own teacups, but on this visit we only saw our server when they brought each course and when we finally managed to flag them down to get the bill. Overall, this visit to Claridges for afternoon tea was not as memorable as our first. Although the food and overall experience was significantly better than at Fortnum and Mason, it wasn’t as good as we remembered from our previous visit and the service left us wanting more. Still a very solid afternoon tea experience, but I’m inclined to try other places for afternoon tea on our next visit to London.